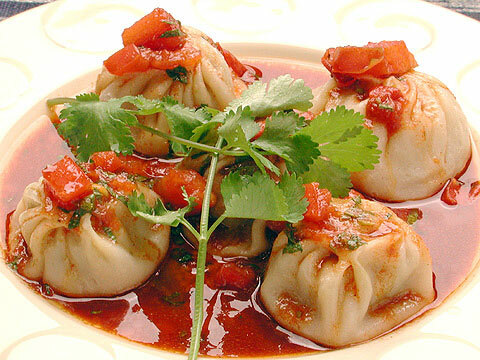 Momo, also momo-cha, is a type of Tibetan and Nepalese dumpling enjoyed all over South Asia. It is similar to Mongolian buuz, Chinese jiaozi, or Central Asian manti, closely related to Russian pelmeni, German Maultaschen or Italian ravioli. Left: Momos served in a tomato-based broth. Meat: different kinds of meat filling are popular in different regions. In Tibet, Nepal and North East India, goat, buffalo, chicken, yak meat, and pork would be the most popular, in Ladakh lamb and yak are common, while in other Indian cities (e.g., Guwahati), goat and chicken would be the most popular meats used in momos. Minced meat is combined with any or all of the following: onions, shallots, garlic, and cilantro/coriander. The mixture is spiced with salt, pepper, and often ground cumin. Some people also add finely puréed tomatoes, and many variations are possible. Vegetarian or mixed momos are becoming increasingly popular in India and Nepal. Potato, similar to Indian samosas, with small dice of firm potato in a tomato based sauce. Cheese, usually a fresh cheese, this variety is common in Bhutan and Sikkim. The dough is fashioned into small circular flat pieces. The filling is then enclosed either in a round pocket or in a half moon shape or crescent. The dumplings are then cooked by steaming over a soup (either a stock based on bones or tomato-based), which is served with the dumplings, as well as chili sauce. 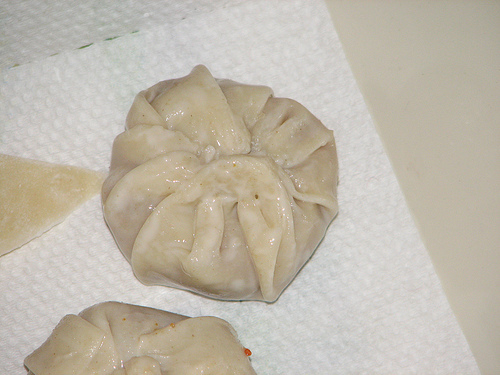 The dumplings may also be pan-fried or deep-fried after being steamed. They are often accompanied by an Indian pickle achar. Momos are a traditional delicacy in Tibet, Nepal, Bhutan, Sikkim, and Ladakh. They are the most popular fast food in Kathmandu valley, Nepal. They are also common in places with noticeable Tibetan diaspora, such as Assam, Mizoram, Manipur, Nagaland, Meghalaya, Himachal Pradesh, and West Bengal.